Having examined which states have the most and least libertarians, I’ve decided to do something similar for the 239 populated towns of New Hampshire. Towns are the most important level of local government here, and therefore the degree of libertarian-ness should make some difference to policy at the town level. 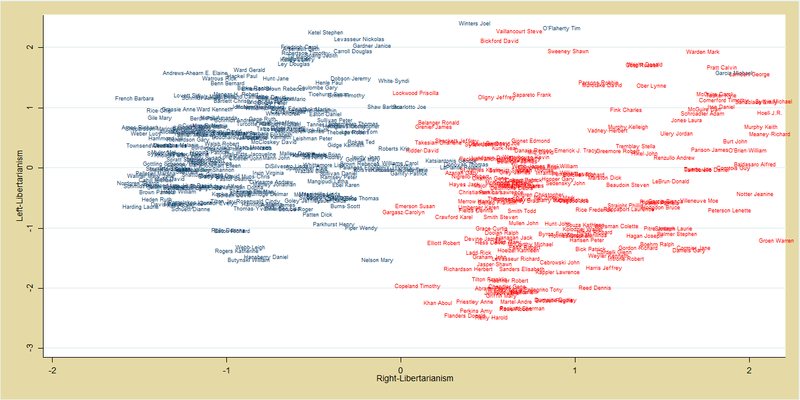 The indicators I use for number of libertarians are as follows: percentage of the vote for Gary Johnson and Ron Paul (write-ins) in the 2012 presidential general election (Ron Paul won a nontrivial number of write-ins in New Hampshire); percentage of the vote for libertarianish gubernatorial candidate Andrew Hemingway in the 2014 Republican primary (he got over 37% of the vote); percentage of the vote for Ron Paul in the 2012 Republican primary; percentage of the vote for Ron Paul in the 2008 Republican primary; and the percentage of voters registered “undeclared” (independent). These are all measured at the town level. As in my research on the states, I use principal component analysis to reduce the correlations among these variables to a single “best” variable expressing their underlying commonality. I also “weight” the observations by population, since New Hampshire has many small towns, where sampling error should be higher (lots of zeroes and high percentages in election results). In fact, weighting the observations this way yields better results, as revealed by the eigenvalue of the first extracted component. These variables do in fact correlate with each other and all contribute positively, as expected, to the extracted component. 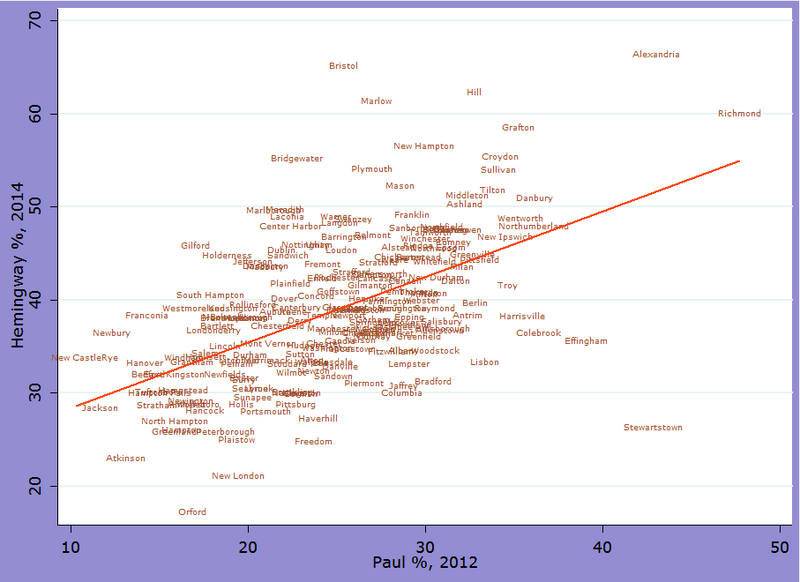 The highest scoring coefficient goes to 2012 Paul primary vote (0.55) and the lowest to undeclared registration percentage (0.25). 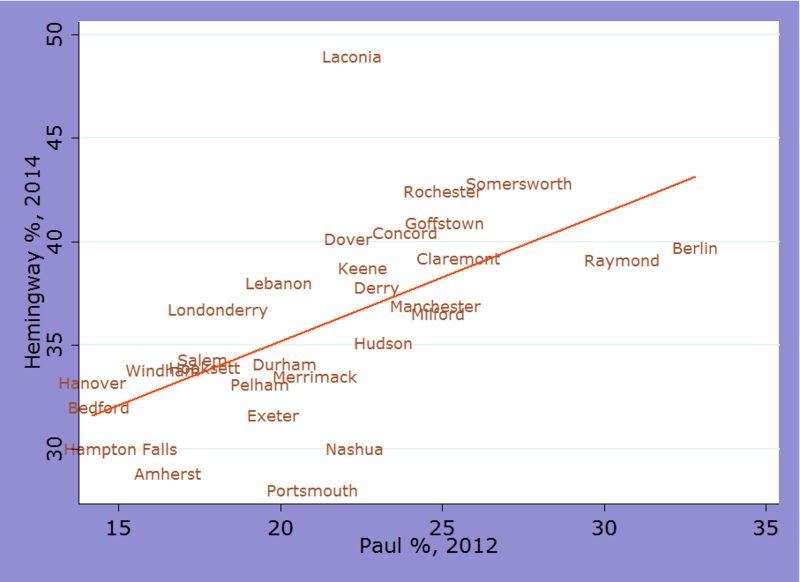 UPDATE: Here are two charts of Andrew Hemingway 2014 percentage against Ron Paul 2012 percentage, by town. The first limits to towns and cities with at least 700 population, the second to towns and cities with at least 10,000 population. As you can see, the correlation is strong. Most of these are in Grafton County, where I also live. They are all small and rural. The most libertarian large town (over 5000 population) is Plymouth (score of 4.5), a left-leaning college town (also in Grafton Co.). The most libertarian-leaning municipality with a city form of government is Franklin in Merrimack County (score of 2.0). Almost all of the towns where libertarian candidates are most popular are in the west, especially northwest, of the state. Three exceptions are Francestown (5.0), Mason (4.3), Hill (4.0), and New Ipswich (3.9), but even these are west of I-93, which bisects most of the state. The top town east of I-93 is Pittsfield (3.2). Four out of these 10 are in Rockingham County on the seacoast. Dixville and Hale’s Location are truly tiny. Bedford is a staunchly Republican suburb with a population over 20,000. In fact, many of the least libertarian places are well-to-do suburbs that are strongly establishment-Republican (Bedford, New London, Hooksett, Hampstead, Windham). 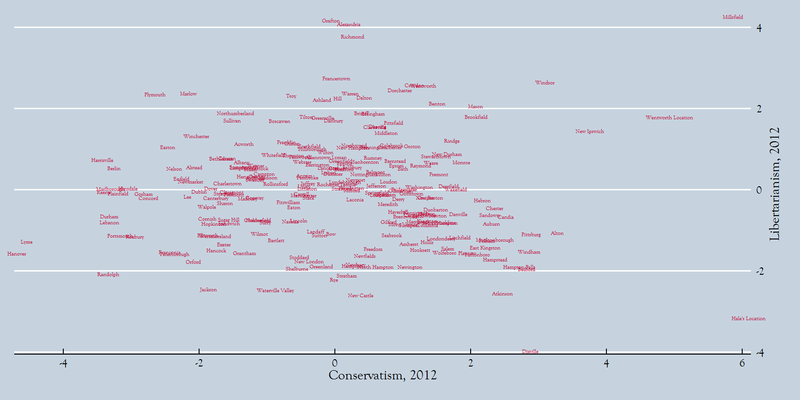 Some of these are not representative of the state in a left-right sense, however. New Boston, Goffstown, Littleton, and Chester are all firmly Republican, while Keene, Lee, and Claremont are if anything even more firmly Democratic. Derry (R-leaning), Manchester (D-leaning), and Sandown (R-leaning) could be considered somewhat representative of the state. While Republicans nationally enjoyed a wave election, Republican federal candidates in New Hampshire underperformed relative to other states. Scott Brown lost very narrowly to incumbent Jeanne Shaheen, dogged throughout the campaign with the “carpetbagger” label. The highly conservative, hawkish Marilinda Garcia also lost in the second congressional district, my district and the more left-leaning one in the state. The governor’s race was close, but first-term incumbent Maggie Hassan pulled it out. 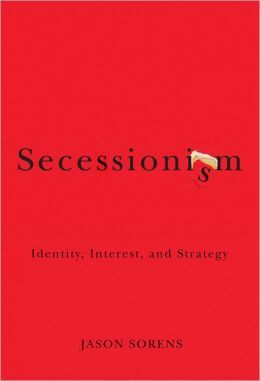 That result was not surprising, since first-term governors in New Hampshire rarely lose (a term is just two years), and her opponent Walt Havenstein had low name recognition and also faced carpetbagging accusations, having just moved back to New Hampshire from Maryland. 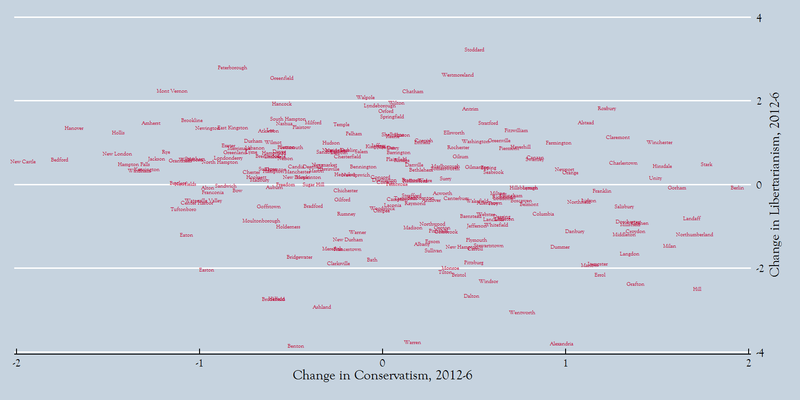 At the state legislative level, however, the GOP did much better. They took over the executive council and state house and extended their lead in the senate. Lacking veto-proof majorities, however, they will need to work with Governor Hassan to accomplish anything. 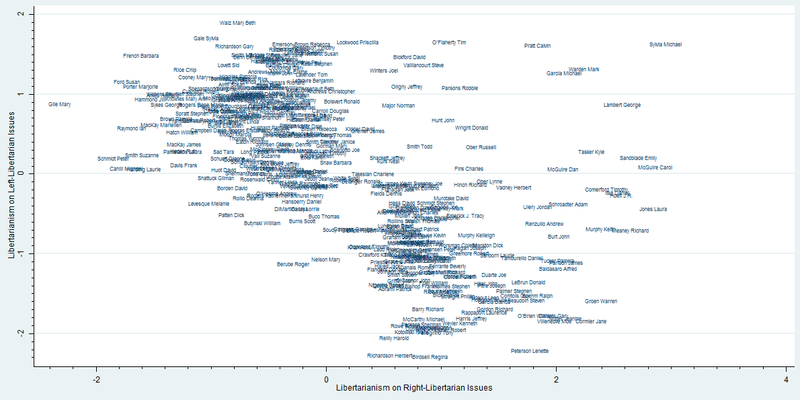 Libertarians did rather well in this election as well. Of the 116 New Hampshire Liberty Alliance-endorsed candidates in this election, 86 won. Not all of those 86 are real libertarians. The NHLA has a mechanistic scoring system for endorsements: as long as you vote 80% pro-liberty on the roll-call votes they track (or for challengers, are 80% pro-liberty in your questionnaire answers), you are endorsed. 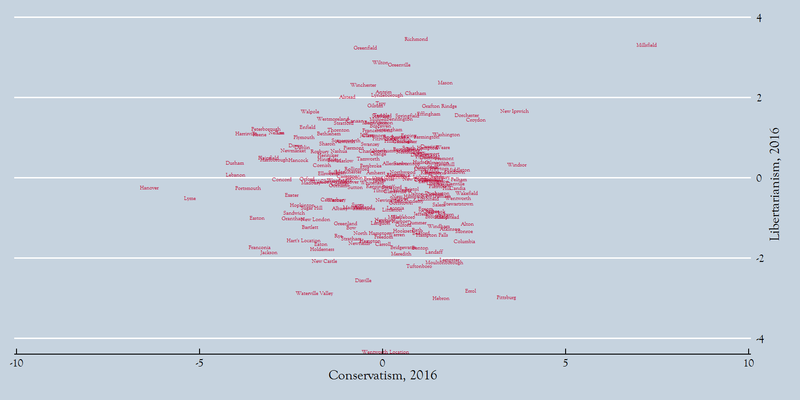 Since most roll-call votes are economic liberty issues rather than personal liberty issues, traditional conservatives often do extremely well on NHLA ratings. Still, a very sizeable chunk of the next state house – around 20% – will be quite liberty-friendly. Unfortunately, four very solid libertarian incumbents lost: three by extremely narrow margins and one by a wide margin because of a Republican wave in his district (he is a Democrat). One metric some people are interested in is the number of Free State Project early movers who won races. I can say that the number is more than half of those who made it past their primaries, and a new record. 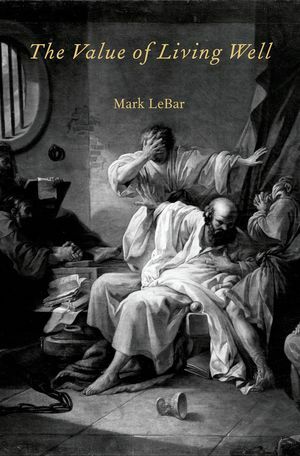 I can also say that this list is both wrong and too short (warning: click link only if you have a strong stomach for paranoia and/or enjoy schadenfreude). Other interesting stories from the election… There is a rather unhinged (and I don’t use that term lightly) Free Stater hater in Bedford, a wealthy restauranteur and sometime Republican bigshot, who did everything he could to defeat a Republican incumbent state senator, Andy Sanborn, because he was friendly with Free Staters. In the end, Sanborn defeated his opponent by a far wider margin than he had in 2012 (the 2014 was a rematch of the two). The Dems sent out last-minute mailers to just about every competitive house district (judging from reports), accusing all the Republican candidates of supporting the “ultra-extreme Free State Project.” That didn’t work out too well for them: the GOP has at least 235 seats in the new state house (out of 400), with three ties (yes, ties) still to be resolved. In a slightly Republican-leaning state senate district that had gone to a Democrat in ’12, an insurgent candidate, Kevin Avard, who spent only about $6000 on the race, upended the incumbent. Avard is a libertarianish conservative, which will make for about three of that breed now in the senate (plus Sanborn and John Reagan).